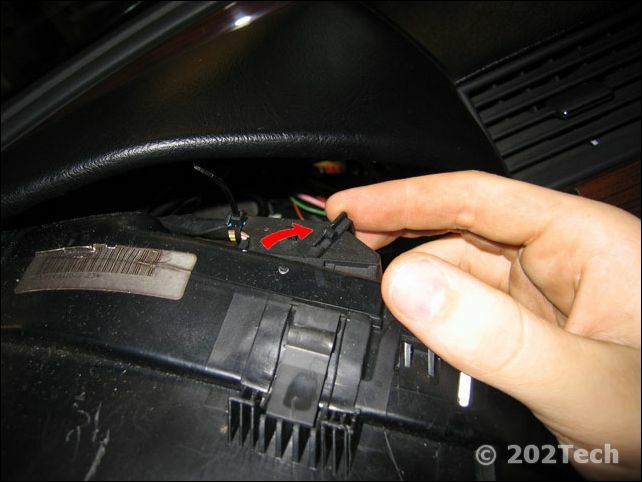 This how-to will cover the removal of the instrument cluster. I believe the process is nearly identical for all years, however there may be a few different things here and there. 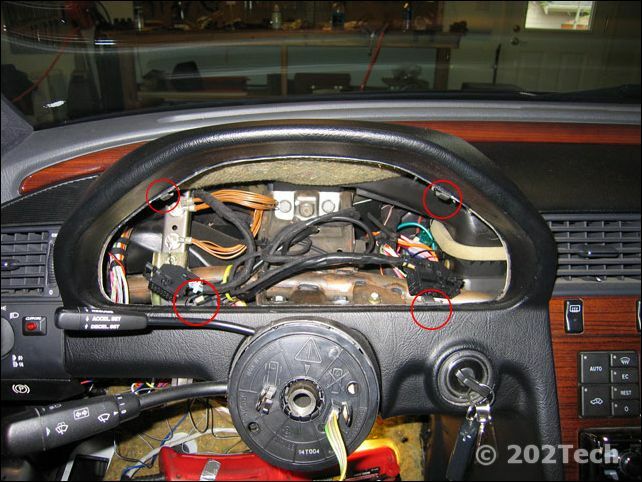 The easiest way by far is to remove the steering wheel to get access to the instrument cluster. This however may not be absolutely necessary. If you have a telescoping steering wheel, I believe it is quite easy to remove the instrument cluster without removing the wheel. I have removed the cluster without removing the steering wheel, and it was VERY difficult, and I ended up scratching the dash board. To ensure you don't damage your dash, I would recommend taking off the steering wheel. 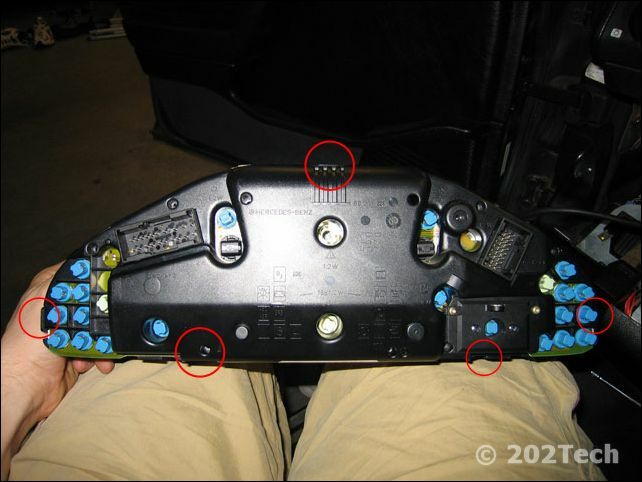 Step 1: Once the steering wheel is removed, the instrument cluster can simply be pulled straight out. This can be done by one of two methods, or maybe a little bit of both. First method is to reach from the bottom (remember in the steering wheel removal section, we removed the knee bolster) and push the cluster out from the back. This will take a good push, and a little shimmying to get it to come out straight. The second way is to buy/fabricate hooks that can be used to remove the cluster. The pictures below show where the locking springs that hold the cluster in are, and also a picture of the tool that I fabricated. Step 2: If pressing out, reach from the bottom and press out the left side of the instrument cluster. That is likely the only side that you can reach from underneath. The cluster must be evenly pulled out, so you may have to push the cluster in a little to even it up. Shimmy it out from there. 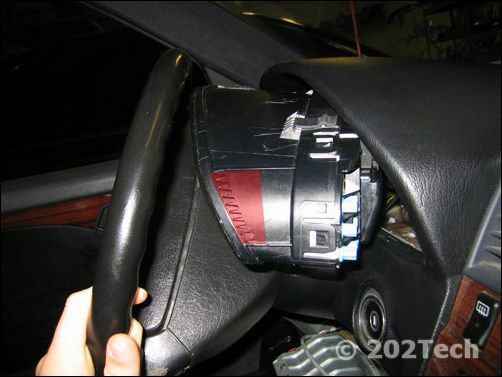 If using the hooks, use some sort of plastic wedge or a credit card even to make a little bit of a gap on the far ends of the instrument cluster. Then slide the removal tools into the cluster by about 1.5-2 inches, then rotate, so the hooks point toward the cluster. Then carefully pull out the cluster by moving one side at a time and shimmy the cluster out. 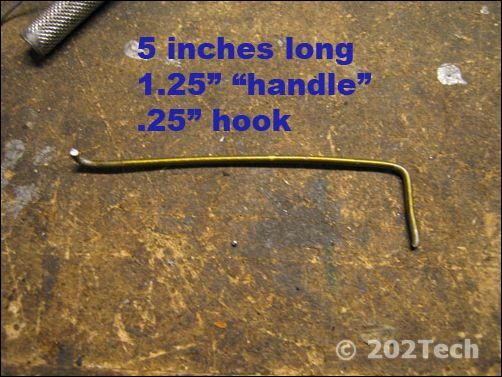 The picture below shows what the hook is grabbing onto. Step 3: Pull the cluster out until you have enough room to disconnect the two wiring harnesses. There is one on either side of the unit. The one on the right is horizontal, and the one on the left goes vertically. To disconnect rotate the little lever on the harness so that it goes outward from the harness. Check the picture below to see what I am talking about. 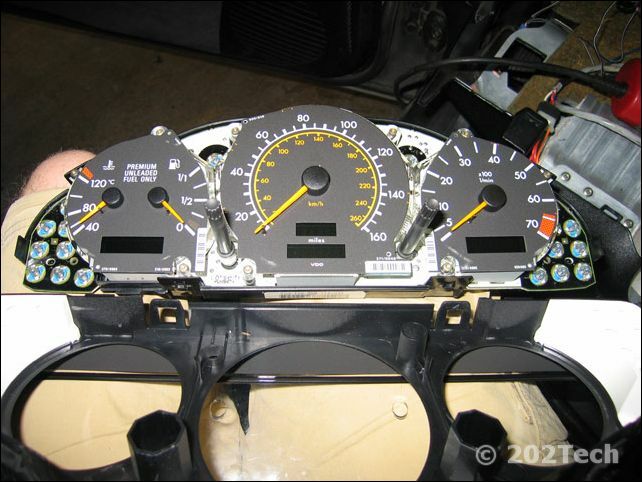 Step 4: If you want to remove the cluster housing from the gauges, there are 5 tabs that need to be lifted and seperated. It is easiest to start on one side and work your way to the other, using a couple flat (slotted) screwdrivers. The picture below shows the locations of the 5 tabs, and also a final picture of the seperated cluster. Installation is reverse of removal. Please note that when reinstalling, make sure the electrical connections are secure, and locked, by moving the lever in the opposite direction when removing it. Also, When pressing in the instrument cluster, press evenly and make sure it is all the way in.